Having been suitably intrigued and somewhat dazzled by the outlandish trailer for Nick Cave’s part-documentary, part-scripted exaggeration as directed by Jane Pollard and Iain Forsyth, and it’s been some time coming since we saw those short clips of Nick discussing life, the universe and everything with the likes of Kylie Minogue and Ray Winstone. With the wait finally over, it came the time for that feeling of excitement that you’re bound to get as a massive fan of the subject of a documentary, as you hope that it’s everything you want it to be. This is something that’s very hard to achieve, but what the film does is give you a little bit of everything, so it’s a film that surprises as much as it enthrals and could easily be enjoyed by a casual fan as much as by someone who’s been following Cave’s career since those heady days in The Boys Next Door all the way back in 1979. The first thing that strikes you about the film is how pretty every frame is, making it clear that the directors’ backgrounds are so deeply ingrained in the world of art. The film positively shimmers, every section of the screen feels vibrant whether Cave is simply sitting at his desk or we’re looking out at wonderful views of Brighton’s coastline and this serves to add to the whole ethereal texture of it all, complementing the mixture of surreal vignettes, snippets from the recording of Nick Cave & The Bad Seeds’ ‘Push the Sky Away’ and Cave’s reminiscing perfectly, serving as the glue that holds it all together. Indeed, the format of the film is non-conventional to say the least. Interspersing moments of non-scripted chat with Warren Ellis, long-time collaborator and member of The Bad Seeds, together with a myriad of other friends and mixing these with scripted sections that showcase Cave’s talent for poetic prose (even if these sections may extend a bit too long in some cases) is certainly a brave move and it often works, the chauffeuring of the likes of Kylie Minogue and Ray Winstone being particular moments where the style really comes in to its own, allowing the pals to discuss things as wide-ranging as age and what it will be like to be forgotten while ensuring that the film is always rigidly structured. All of this could feel awfully pretentious if it wasn’t as well handled as it is, and Cave’s inherent charisma provides it with a typical undercurrent of surreal humour that’s bolstered by his friends and guests, particularly Ellis, who is wonderfully laid back and consistently funny throughout. Of course, the film provides an insight in to the recording process of The Bad Seeds, something that will resonate deeply with devoted fans but are maybe sections where the film doesn’t accommodate so much to the casual fan as heavy as they are with the material. It does also mean that more of the runtime is taken up with performances, but obviously extra content will make its way on to DVD and those interested can get hold of it when it’s released, so it doesn’t feel like too horrible of a compromise for us to catch a glimpse of some studio work. These moments do well at providing a bit of a break and reminding us just how powerful the music that Cave makes is, allowing us to pay even more attention and be more involved in those moments where Cave is looking through his past work, whether it’s with The Birthday Party or the early days of The Bad Seeds. 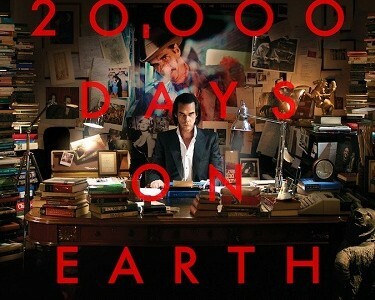 ‘20,000 Days on Earth’ is an emotional, euphoric, often very funny and intelligent film that blends its elements of documentary and scripted vignettes brilliantly, creating this ramshackle view of Cave’s life that suits him perfectly. Sure, it would have been much easier just to follow him round for a week or so, but it wouldn’t have been anything like as original and interesting an experience as this was, even at points where it doesn’t work quite so well as others. While it’s definitely the case that this film, or at least simply this cut of it, only scratches the surface of Cave’s psyche and even motivations and is much more of a show, it stops being about getting to understand him deeply as a person in this moment, and more about what he has to share with us, whether those are nuggets of wisdom or simply his way of understanding what he has become over the years as his persona grew and changed. It’s definitely worthwhile, and sure to be a treat for those who always knew that this was never going to be just your average music doc, but something a whole lot more interesting than that.